Are you remodeling this time of year? This will be my first Thanksgiving and Christmas in my new kitchen. Last year we had a contractor literally in our kitchen ON CHRISTMAS EVE hanging our Dutch door. I was so happy he was willing to do that, but I’m pretty excited to have the kitchen finished and to myself this year. I can’t wait to set up my Christmas kitchen! But before I get going on all that festive stuff (soon, though, YAY! ), I’ve had quite a few questions about my kitchen flooring. I somehow neglected to do a post specifically on the herringbone floor tile. I know some of you have also asked about a post on our cabinets and lighting, too. Great ideas! I will for sure get to those topics, but it may be January before that happens :). 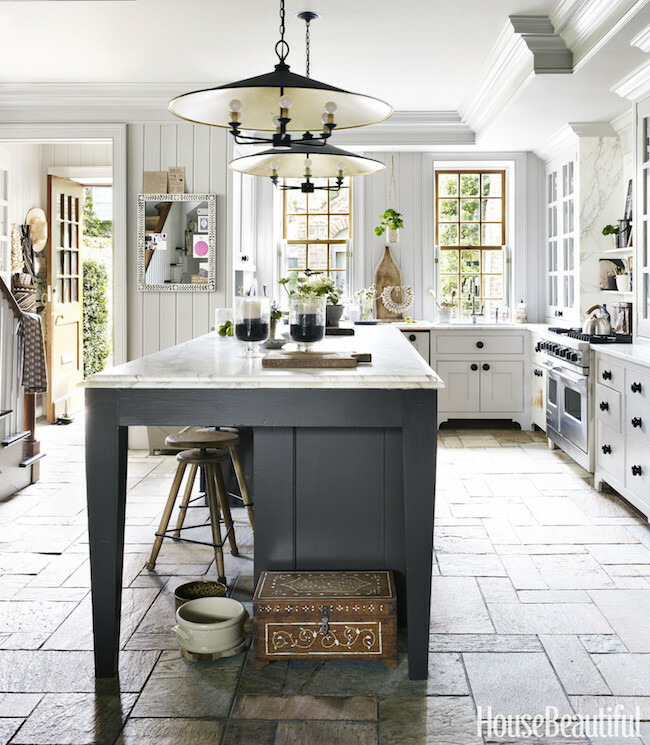 We debated for months about what to choose for our kitchen flooring. There were so many options! Each one had its own benefits. 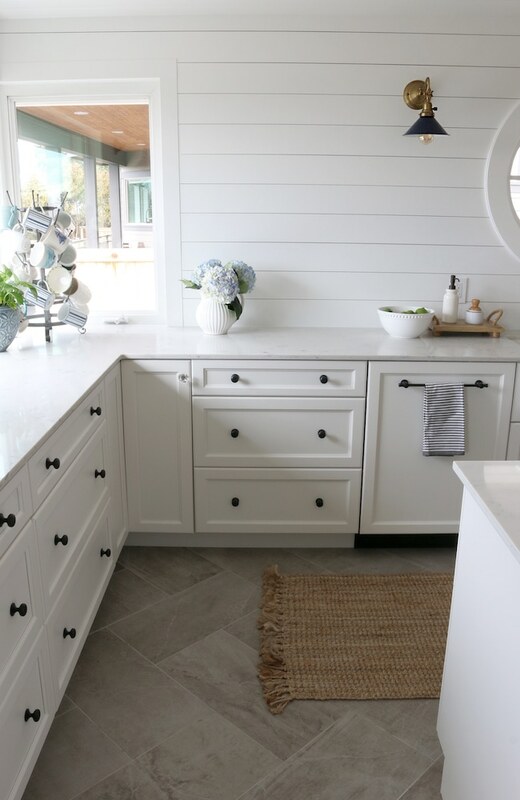 As is the case with many remodels, there were many additional factors to consider such as cost, coordinating with connecting rooms and an exterior door. It was so hard to decide. But to make a long story short, we decided on a fairly neutral porcelain tile. I wanted to be able to update my look in here throughout the seasons. That meant I needed to have a flooring that could look amazing on its own (especially for those summer months when we don’t even need a rug!) but that also set the a perfect backdrop for rugs and runners in a variety of textures, patterns and colors. This particular tile is a great neutral with beautiful coloring and texture on its own. Because our kitchen is a galley layout, we thought it would also be nice to have flooring that gave a sense of movement in the space. Laying the tile in a diagonal pattern helps your eye to keep moving, which can make the narrow space appear wider and at least a little larger than it actually is. We decided to have our tile laid in a herringbone pattern. 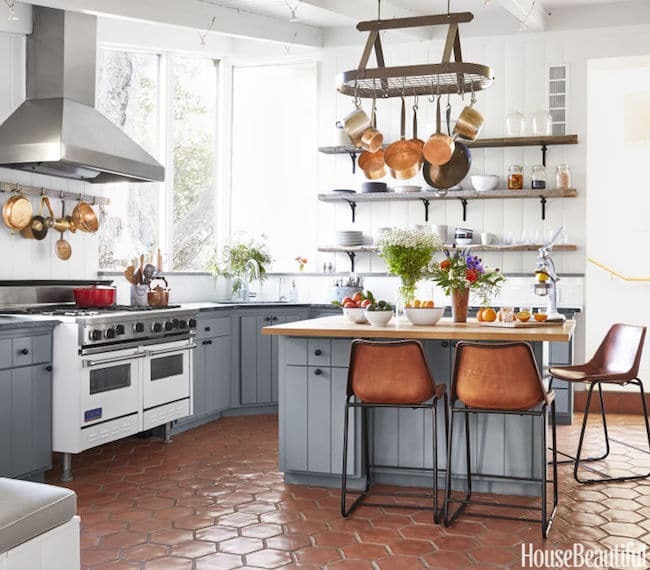 You don’t have to buy a specific “herringbone” tile to accomplish this look. We didn’t! Our tiles are individual, large and rectangularly shaped. At first we were thinking to use small tiles but we are so happy we went large which makes the pattern bold but simple and easy on the eye. The tile installer laid the individual tiles in the herringbone pattern. 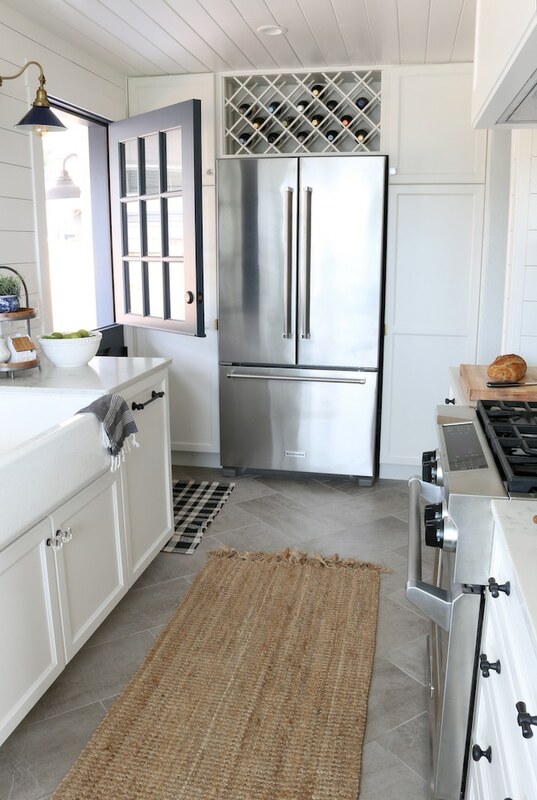 Our tiles actually start under our cabinets, but you can also often lay tile after cabinets are installed (just make sure you will be able to pull appliances out once the tile is laid, if you decide to go that route.). 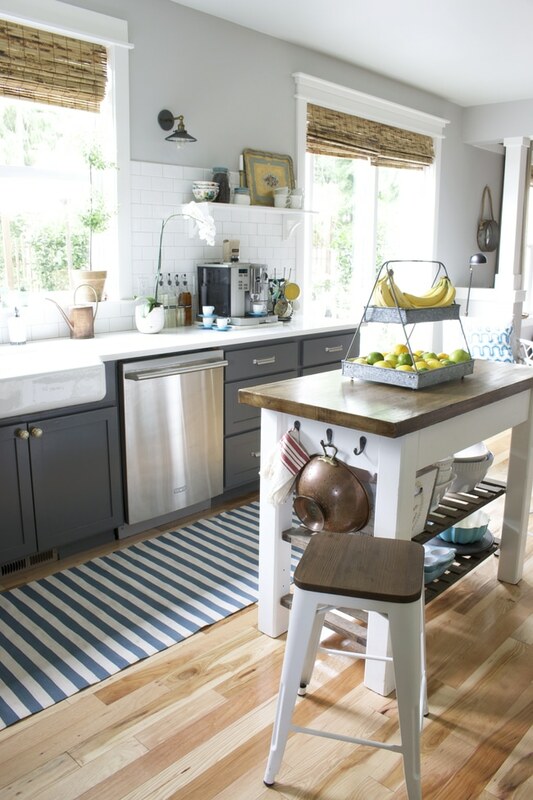 Are you remodeling a kitchen right now or planning one in the near future? 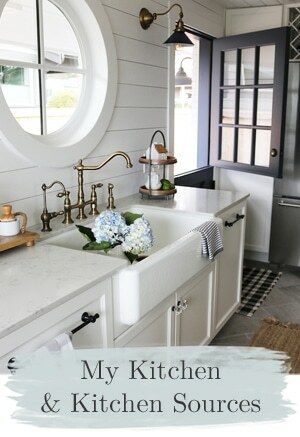 You can find my kitchen remodel posts linked below if you need any tips or inspiration. 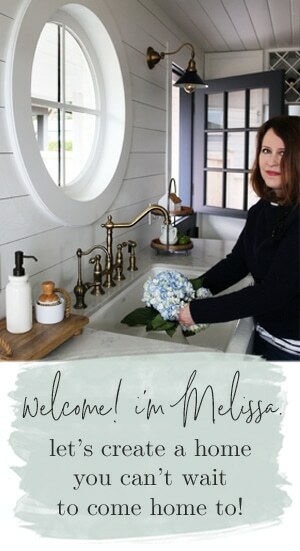 If you missed the kitchen reveal, you can find it here! Hello! I so enjoyed readying your thoughts yesterday about winter in the kitchen. 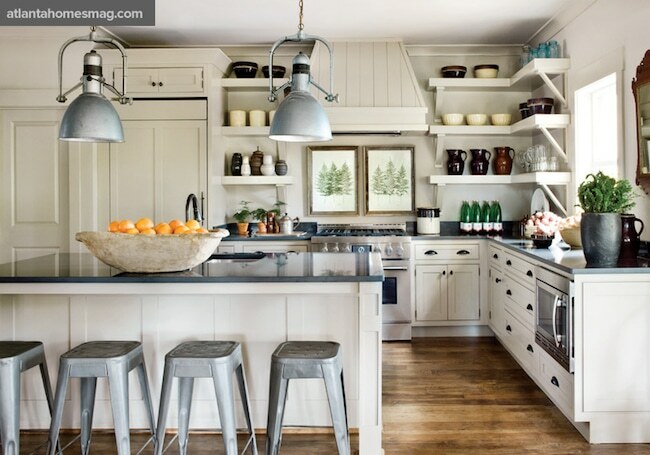 I hope you’ll tell me about your kitchen today in the comments, it’s fun for me to hear more about where you live! 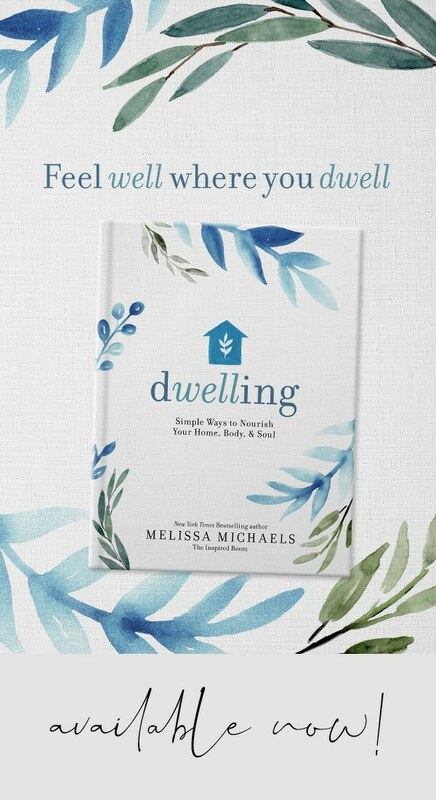 If you missed the first five tips in part one, you can go back and catch up after this post. Today we’ll just jump right in with #6 and the second half of the 10 ideas for cozy winter rituals to cheer us up in the kitchen. I’ve just started organizing our new kitchen (not to worry, I’ll show you the entire kitchen just as soon as I can!). It is been a wonderful evening activity on these super cold nights when the kitchen is still warm from cooking. After I unload the dishwasher, I start puttering about the room assessing what would bring the most joy in each drawer. It’s enjoyable for me to find pretty containers to group spatulas, utensils or baking supplies. You can even use things you already have! Little bowls, trays and baskets make wonderful drawer organizers. If you don’t have something that would work, measure the drawers and make note of the sizes and shapes you need. There’s a coziness and peace that comes from puttering and nesting in the wintertime. There’s a kitchen organization shop on the blog, so go see what might inspire you! In the darkness of January, how could you bring more light to your kitchen? A reader yesterday spoke of having a skylight in her kitchen that warms up her space with sunshine and allows her to enjoy watching the birds outside even on a freezing day. Dreamy! 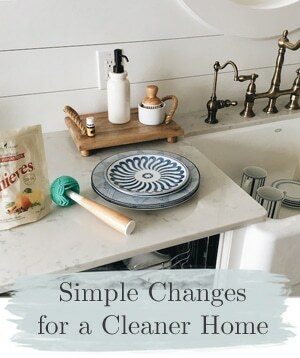 While we can’t necessarily add in windows or wire in new lighting this month, maybe we could set a lamp on the counter or bring in some accessories that can provide a sense of warmth and light in a dark kitchen. 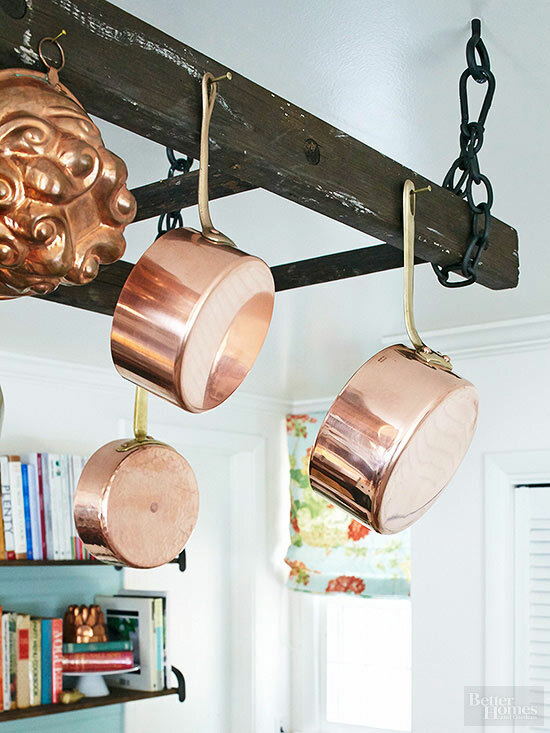 Copper pots can reflect light and warmth that is already in the room. Sometimes a lack of natural light can be compensated for by simply adding more warm homey touches. Go for an extra cozy vibe in the winter, not a sterile space. 8. Refresh your kitchen linens. If your linens and dish towels have seen better days, cheer yourself up with a new set. Sometimes that’s all it takes to make a girl happy. Am I right? 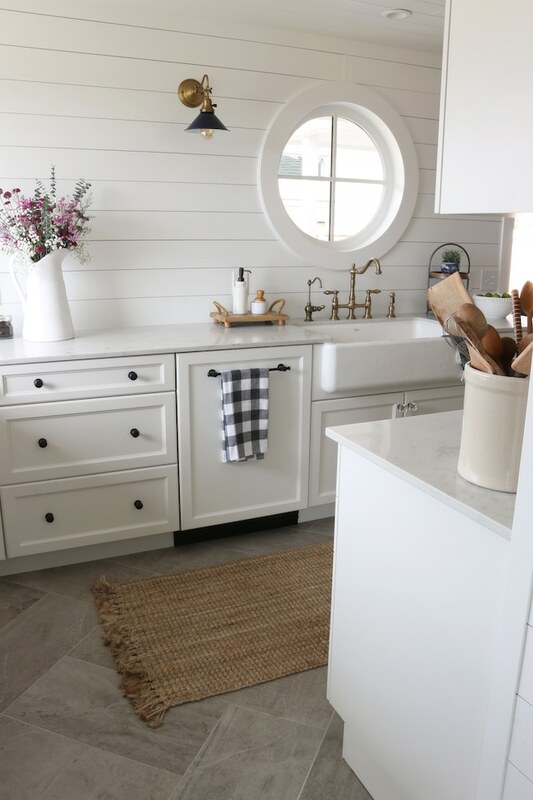 These buffalo checked towels are my current favorites and they are on sale right now! 9. Focus on your health and well-being. Make your health and happiness in the kitchen a priority! What are some special habits you could practice this month to contribute to your own well-being in the kitchen? Start every day with your blinds up and end the day with a clean sink. I don’t enjoy drinking freezing cold water in the winter time (I’d much rather stick to holding a hot cup of coffee, ha! ), but it’s a healthy way to start the day. To help inspire me, I fill up my pretty mint colored Klean Kanteen with cold filtered water every morning. See my water bottle in the photo above? That’s a tiny kitchen sneak peek, too. :) Get a good water bottle here. Fun fact, I ordered a special bamboo and stainless cap for mine (not shown the photo) here. When the bottle is empty, I refill it so I continue to drink plenty of water all day long (and I don’t add to the dishes in my sink!). 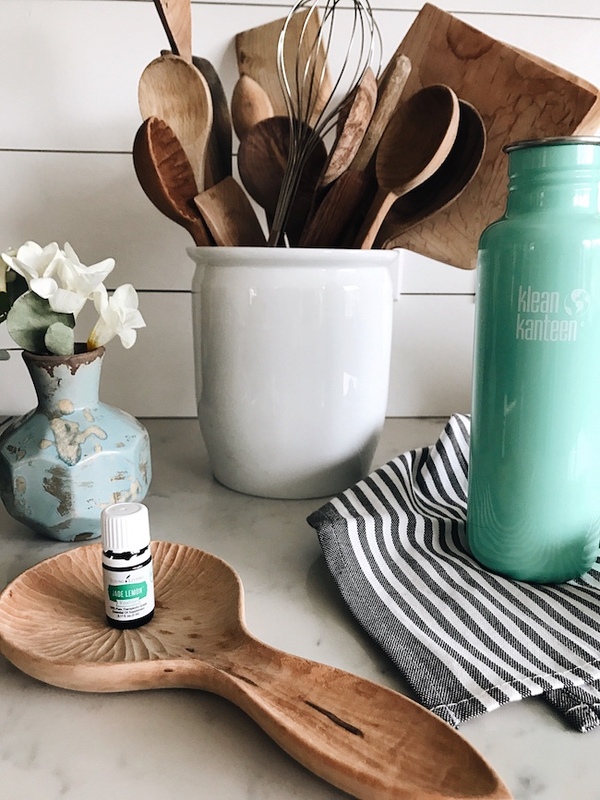 Sometimes I even add in a little extra healthy zing with pure essential oils (only use in a stainless or glass water bottle and use oils labeled as safe for dietary use, find quality ones here) or a slice of lemon or lime so it tastes super refreshing. 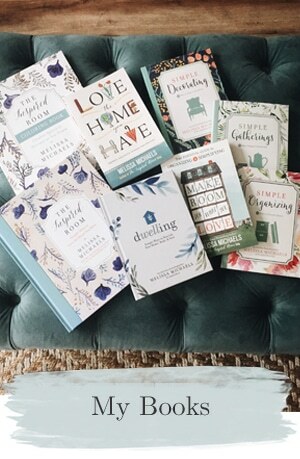 Since winter can feel so dreary and lifeless, bring in things to remind yourself that spring is on the way. Add a plant or a tiered stand for brightly colored fruit or vegetables. 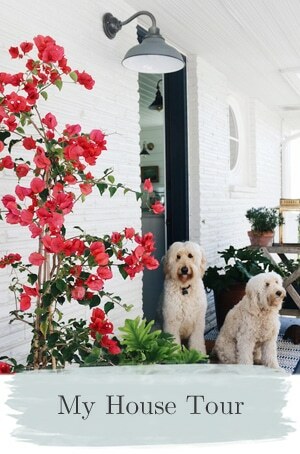 Make a weekly trip to local farmer’s markets to bring home flowers. We love going to farmers’ markets in Seattle regularly right on through the season to pick up winter vegetables, fruit and inexpensive bouquets. Use this season to plan a kitchen garden. What herbs or vegetables could you grow in your garden this year? 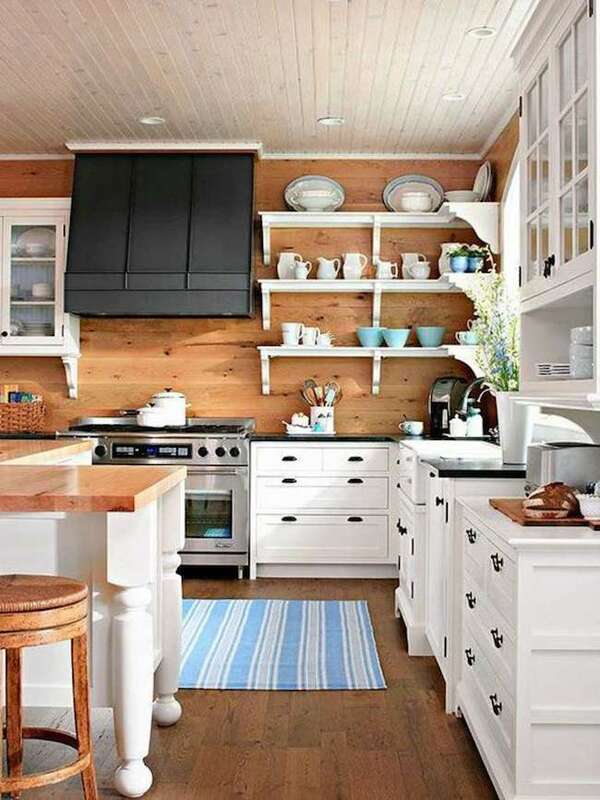 So, tell me about your kitchen in the comments today! What do you love about it? What do you not love about it? Don’t forget if you missed Part One of this post, you can catch up here!